This handy Turners Select™ 3/8" Threaded Tap cuts a thread that allows you to easily thread a blank on the mandrel and provides a better bond when gluing the turned blank to bottle stoppers, project handles, and more during assembly. Comments On Jul 15, 2018:Not having much experience with turning or just a tap. This tool made it a stress free process with an overall great experience. Comments On Jul 27, 2016:For tapping turning projects it works very well. Sharpe and well machined. 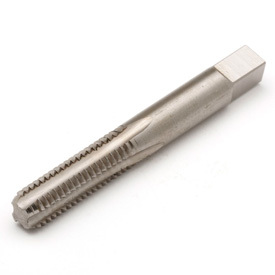 Comments On Apr 07, 2015:If you're looking for a tap that cuts internal threads for a 3/8" hole at 16 teeth per inch in a wood surface, then this is the tap for you! I have had no issues using this tap to cut threads. Comments On Feb 10, 2015:I have used this Tap multiple times for my Bottle Stoppers. It is a must have in your turners arsenal. Sharp and precise with never an issue. Cuts through multiple density of woods with nary a problem. Highly recommend to everyone. This is a must for bottle stoppers. Comments On Jan 15, 2015:I've used several different brands of taps for my projects and I wish they all performed as well as this one. The teeth on it are very aggressive and blast right through material time after time. I've tapped dozens of projects with this thing and it still works like it just came out of the box. Comments On Jun 08, 2014:This tap is great and always does the job, but you need a handle to go along with it. You could just use a wrench, but I have found that it would be so much easier to tap your blank using a T-handle. Comments On Apr 08, 2014:Inexpensive and versatile. I have made several handles with this and it allows you to make great connectors like with a handle extender for a replaceable turning handle.